We’re celebrating one year of FIRESTORM FAN.com this week! In honor of the occasion, we’ve got an amazing interview with Firestorm co-creator, Gerry Conway! 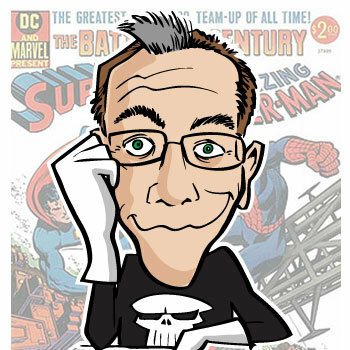 Gerry Conway was one of the most prolific comic book writers of the 1970s and 80s. His writing credits go on for miles! He’s probably best known for co-creating the Punisher and scripting the death of Gwen Stacy in the Amazing Spider-Man. He also wrote for and produced such TV series as Law & Order and Diagnosis Murder. Back in 1977, Gerry created Firestorm the Nuclear Man along with artist Al Milgrom. Gerry continued to write the character of Firestorm for about nine years. Gerry recently returned to comics after an almost 20 year absence with the insightful mini-series, The Last Days of Animal Man. Gerry is a true professional and a joy to talk with. I really appreciate how generous he was with his time. We talked for roughly 80 minutes about Firestorm’s creation, artists, the writing process, creator rights, the DC Implosion, merchandise, where the character has journeyed since his involvement, and much more! Given that we talked for so long, I’ve opted to break the interview into two parts. The first part runs about 50 minutes long, while the second part runs about 30 minutes and will be available here later this week (UPDATE – part two is available now by clicking here). You may play part one of the interview right here on the FIRESTORM FAN site with the handy-dandy player below! I apologize for not offering the interview in text format, but transcribing an interview that long would have taken months. Alternatively, you may download the file and listen to it on an MP3 player or your computer. You may download part one of the interview by right-clicking here, choosing “Save Target/Link As”, and selecting a location on your computer to save the file (48.6 MB). That’s the perfect length for my morning subway commute. Looking forward to hearing it! Very cool, Shag! I’ve been looking forward to listening to this. Very cool project. I sent out a Tweet about it to my readers as I’m sure they’ll be interested. Since I don’t commute to work, it might be awhile before I can set aside a block of time to listen to the whole thing. Any chance of a post with a bulleted list of highlights? Great job. It was awesome to hear the stories of Flametop’s creation and what Gerry thought about the direction Firestorm went in after he left the character. I’m just glad to finally know it’s pronounced “Jerry,” not “Gary.” Stupid soundless comics. Also, good to know I my read on Firestorm was intentional (Flash Thompson bitten by spider,) and I’m glad Firestorm missed out on Killer Croc. He works much better as one of my favorite Batman villains. Plus, Vixen! For seven seconds or so! That was awesome Shag – I’ve been looking forward to listening to this in the weekend and it definitely didn’t disappoint! He’s so honest and straight forward, it makes the interview as insightful as it is refreshing. Right on to part 2! Wow! What a terrific interview. I’m going to listen to Part Two this weekend. Gerry sounds as intelligent as I’d hoped and is justifiably proud of his work without being precious about it. I picked up on so many aspects of the character that he feels he jacked into. Flash Thompson bit by the spider indeed! Cliff Carmichael never quite worked for me because he was essentially the Peter Parker character acting like Flash Thompson. If his disdain had been somehow less physical and violently angry, he’d have made a much stronger supporting character. It’s true, when characters stray too far from the iconography of their original make-up they become unrecognizable. Firestorm never worked for me except when he’s a bit of a goof alternately ignoring and accepting advice from his older, more sensible alternate self. And the whole idea that the Prof couldn’t remember what was happening and it was slowly destroying his life always tugged at my heart. And hey, what’s wrong with meeting Firestorm first through Superfriends? 😉 😉 That’s how it worked with me. Then many years later I had my memory of him jogged by a mention in Wizard or something and that started my collecting of back issues. I trust it worked the same for a lot of us.